Stems: Prostrate or erect, circular to egg-shaped, 2-5 inches long, 2-4 inches wide, flattened, bluish green, waxy. Leaves: Leaves absent. Pad-like stem segments with 1-6 spines per areole; spines 2 inches long or more, straight or sometimes twisted, not barbed, often only on uppermost areoles; bristles abundant, tiny, yellowish brown, barbed, at bases of spines. Inflorescences: 1 to several flowers, sessile on margins of pads. Flowers: Showy, broadly funnel-shaped, 2-3 inches wide, yellow to copper, centers sometimes reddish; stamens numerous, filaments yellow or reddish. Fruits: Berries, fleshy, globe- to egg-shaped, 1-3 inches long, red or purple, not spiny; seeds numerous, disk-shaped, flattened, tan to white. Habitat: Dry rocky prairies, hillsides, and overgrazed pastures. Forage Value: Prickly pear has been used in the past as an emergency livestock feed after the spines have been burned off. Uses: In times of food shortage, Native Americans ate the raw or stewed fruit. Wildlife such as deer, jackrabbits, and turtles eat the fruits and help spread the seeds. 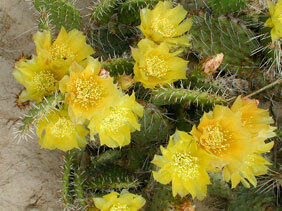 Comments: Prickly pear endures drought well due to its succulent pads and extensive root system. It increases during dry periods and decreases when conditions favor the growth of grasses.